Protects public health: Monitoring allows public health advisories to be issued to deter exposure to waters with confirmed harmful blooms. Data are also used in shellfish management to prevent the harvesting and sale of shellfish that pose a human health risk. Informs management response to bloom events: Data obtained about the occurrence of HABs help to devise mitigation strategies to reduce the likelihood of repeated blooms. Harmful algal blooms (HABs) occur in fresh and salt waters, and are events of rapid and prolific growth of toxin-producing microscopic algae—known as phytoplankton—or cyanobacteria, which are often referred to as “blue-green algae,” though they are technically not algae. Phytoplankton and cyanobacteria are both single-celled organisms that obtain energy through photosynthesis, like plants. They are a natural and important part of aquatic ecosystems, providing food to higher levels of the food web, but under certain conditions they grow rapidly, creating blooms that can have negative effects for humans and natural environments. A HAB outbreak occurred in 2014 in Mashpaug Pond. The thick mats began to decay and smother aquatic organisms. Photo courtesy RIDEM. In freshwater, blooms of cyanobacteria are a serious concern. HABs are a known public health concern for swimmers, waders, shellfish consumers, and pets. While not all algal blooms are toxic, harmful algal blooms, by definition, always involve the release of toxins. 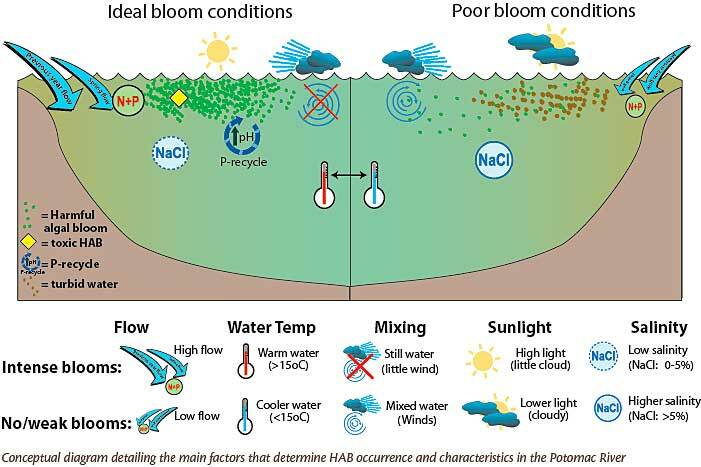 For example, cyanobacteria HAB bloom events release toxins that may pose a serious health threat to humans and animals even at very low levels. Production of toxins can vary significantly from bloom to bloom: some species of cyanobacteria do not produce toxins—and therefore are not a harmful algal bloom, and instead are often described as nuisance algal blooms—while others only produce them in certain circumstances. Research continues into understanding these organisms. There are several factors that can contribute to a HAB event, but even when many of these factors simultaneously occur, a HAB may or may not happen. 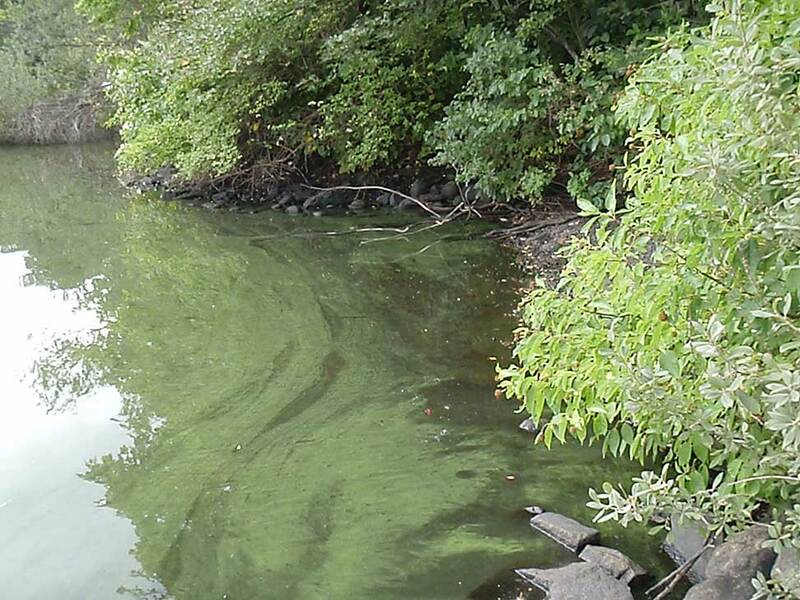 In freshwaters, cyanobacteria thrive in well-lit, slow-moving water that has high nutrient conditions. Human activity has increased the amount of nutrients in our waters from releases of wastewater, runoff from agricultural and residential fertilizer, and pet waste. Monitoring for HABs is necessary to detect conditions that may pose threats to animals and humans and provide a basis for management actions including the issuance of public health and restrictions on the harvesting or sale of shellfish. Additionally, monitoring over time may help us better understand the relationship between HABs, changing climate and nutrient pollution, and adapt management actions accordingly.